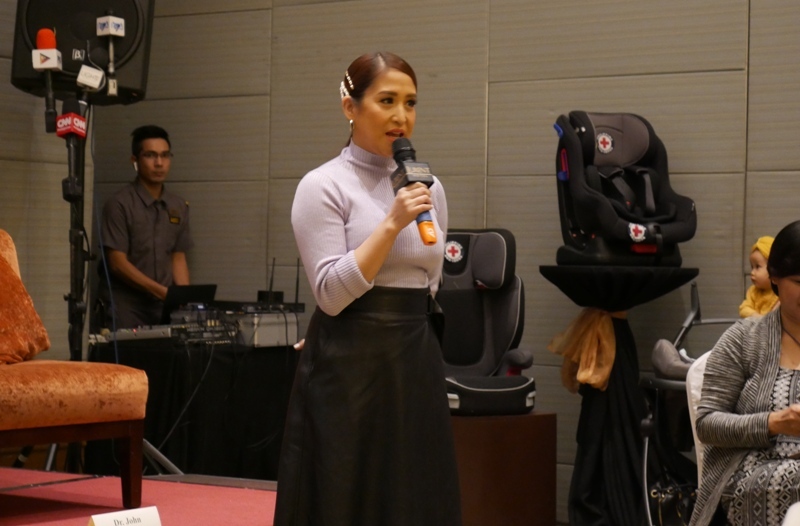 Local artist-singer and TV host, Jolina Magdangal, expressed her support in the signing of Republic Act No. 11229, otherwise known as the Child Safety in Motor Vehicles Law, during a press conference organized by the Department of Transportation together with the Global Road Safety Partnership and other road safety advocates on Tuesday. The actress recalled her family’s experience of being in a car crash a few years ago when a passenger-van driver dozed off on the wheel and crashed onto their car. She suffered from cuts and bruises but her son, Pele, was unhurt and unfazed, “I believe the car seat did much on saving his life. That’s why I believe this law is important,” she said. “As long as I can help parents understand the importance of child car seats and awareness of the law, I will,” she promised. “[the DOTr] has been on the forefront of many road safety advocacies, there are many strategies to address road safety and we are hoping private sectors help push for road safety campaign to reduce car crash injuries and death,” he added. The GRSP is composed of road safety advocates that include Initiatives for Dialogue and Empowerment through Alternative Legal Services (IDEALS Inc.), Vera Files, ImagineLaw, Dakila, Legal Engagement Advocating Development and Reform (LEADER), Peace & Conflict Journalism Network International, and Philippine Red Cross.